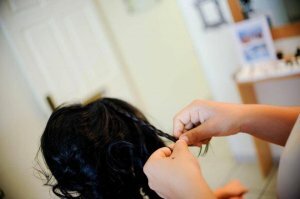 Here at Suzanne Morel, we feel fortunate to be able to work with lovely, confident brides on a regular basis. It’s always so fulfilling to see a bride looking and feeling gorgeous on the most important day of her life! For Alison’s look, we styled her sleek black hair into a soft up-do at the nape of her neck. 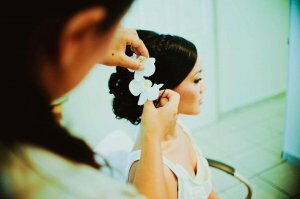 A fresh orchid bloom set off the hairstyle, and looked stunning for her photos. Despite the fact that the wind was gusty on Alison’s wedding day, her hair stayed perfectly in place through the end of the evening. With Alison’s make-up, we kept the focus on her beautiful dark eyes. We did a heavy liner and dramatic eyelash, finishing the look with a sweep of blush and a peachy lip. 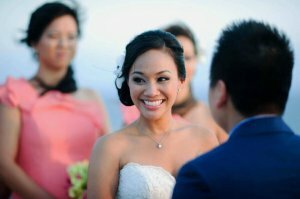 Her wedding make-up was glamorous and completely fitting for this stunning bride! 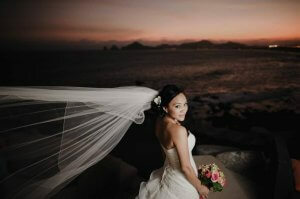 This entry was posted in Blog and tagged Cabo Wedding Services - Tammy Wolff, Dreams Los Cabos, Los Cabos wedding, Suzanne Morel Face & Body Care, Wedding hair and make-up Cabo, Wedding Sunset Da Monalisa.